The goal of CBDprime is human health. However, our ecological footprint also plays a role, the way we deal with our environment or our nature. That’s why we focus on the most environmentally friendly production possible, as well as a fast, efficient and climate-friendly transport of orders to our customers. Basically, we distinguish between parcel shipping between primary packaging and repackaging. In the FIRST PACKAGING we use 100% environmentally friendly, unbleached cardboard in high quality to prevent damage to the ordered products during transport. In addition to the shipping cards, the packaging materials also contain a high percentage of recycled content and consist of environmentally friendly packaging paper. In REPACKAGING, we use packaging materials from our suppliers’ packages to resend our orders. The re-use of these materials is the same as the packaging in the first shipment because the materials must not be immediately disposed of. In this case, other packaging materials can be used as wrapping paper such as air bubble films or cavity fillers. If already used cartons are in good condition, we will use them again to avoid unnecessary carton use. The carrier material of the adhesive tape consists of paper in a thickness of 60 g / m². The adhesive used is natural rubber with a bond strength of 110μ. 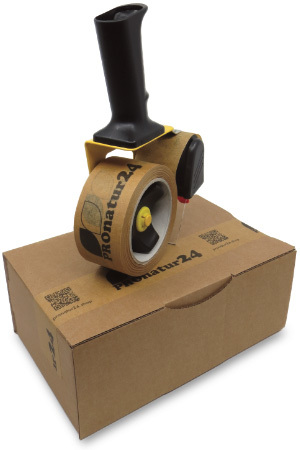 Although the tape is ideal, it is still here to avoid unnecessary material consumption. With the latest generation as shipping cartons, we manage to halve the need for environmentally friendly adhesive tape without affecting the packaged products. When labeling, we completely dispense with printing technologies that consume ink, toner or color transparencies. All of these printing technologies make it necessary to store containers, which ultimately are recycled as plastic (petroleum), but most have to be disposed of as residual waste in an environmentally damaging manner. We use the environmentally friendly thermal printing process, which prints with heat rather than ink, toner or color foil. Colors are not possible and thus our logo black instead of green. Watch out! All our original packaging goes into waste paper. Or you just use them again! Repackaging can contain not only cardboard but also plastics and compostable materials. Simply dispose of separately separated. The Predict service of DPD is a chargeable additional service, which we have also chosen for various reasons. We do not pass on the resulting surcharge to the customer. DPD ensures a very efficient transport route, which is automatically conducive to climate protection as unnecessary routes are avoided. And thanks to DPD Predict, the customer receives information about the package from PROnatur24 up to one day before the parcel delivery and can also redirect it if necessary. With this we manage together with the customer that it only takes a single trip to deliver the package which also does not burden our climate any more than absolutely necessary. If the conversion to electric transporters is successful and the electricity for it is no longer produced by climate-polluting power plants, this would be the next step for a sustainable package transport. Every printed bill requires power, paper and, depending on the printer, ink or toner. Our goal should be to avoid the consumption of pointless energy consumption. Even the small part of a bill printing counts here because it consumes valuable resources that are not absolutely necessary. The delivery note must be for checking during packing and unpacking, but not the invoice. We send the PDF invoice for ordering to the customer conveniently and climate-friendly by e-mail, together with the package tracking link in a single e-mail. At this point we ask our customers not to print the invoice if not absolutely necessary. You can search and open them at any time in the inbox, losing a bill is impossible – a very positive side effect in our eyes. Let’s look at our planet together, we only have this one. Think also of the following generations. PROnatur24 » committed to man and nature!